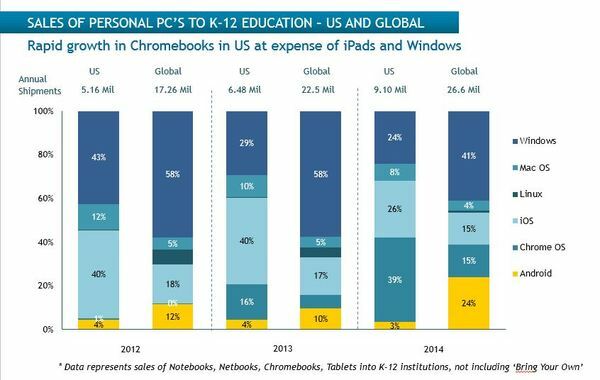 The projection is part of Fisher’s “Personal Computing in K-12 Q4 2014 Market Track Report,” to be released Wednesday. Next year, the company predicts a 10 percent growth in mobile devices in the United States alone, and a 12 percent growth globally. Futuresource’s predictions come despite some K-12 officials approaching expensive new technology projects with caution in the wake of a number of high-profile mishaps in districts. Just last week, Los Angeles Unified School District Superintendent Ramon Cortines announced that his district cannot afford to provide computers to every one of its 641,000 students, as well as staff and administrators. Chromebooks—which commanded 39 percent market share in the U.S. in 2014—overtook Apple’s iPads, at 26 percent, as the bestselling device on the market last year, the report found. 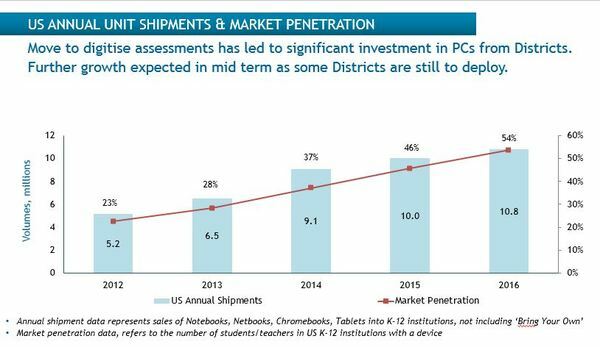 More than 3 million Chromebooks shipped in 2014, according to Futuresource statistics. “Chrome has absolutely flown,” said Fisher in a phone interview. “It has an attractive price point” for districts that need to prepare quickly for online assessments, he added. Fisher said it will be important to keep an eye on the potential growth of so-called “2-in-1s,” convertible computing devices that can act either as tablets or laptops, depending upon whether the keyboard is attached or not. Futuresource expects these convertible devices to gain traction and market share in 2015.